There are two types of trips: those that go completely according to the plan and those more interesting ones that leave room for improvisations. Also, there are two types of travelers: those who prefer their comfortable and planned schedule and those that enjoy the unexpected. If you are more like the second type, more like us, you would have totally loooooved to join us for our little adventure to Gili Trawangan. Michelle and I had been in Bali for a couple of days already, and her parents (Jen and Den) just joined us that day in our secluded little manor in Seminyak to travel with us and relax in Gili Trawangan. Everything started that night while packing before leaving. Our original plan was to take a two-hour fast boat to Gili Trawangan and be there by mid morning to check in and start enjoying the paradise pleasures of the island. Yep, that was the plan… Good thing I’m a bit of a planning freak and checked my email just before bed time (I can hear Michelle making fun of that now :-)). 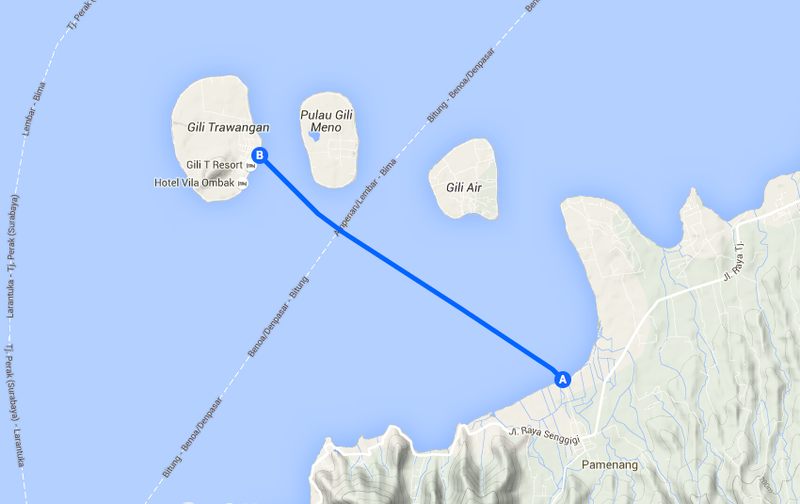 Apparently the harbour master in Bali had decided to close the fast route to Gili islands due to bad weather and we were stranded once more. 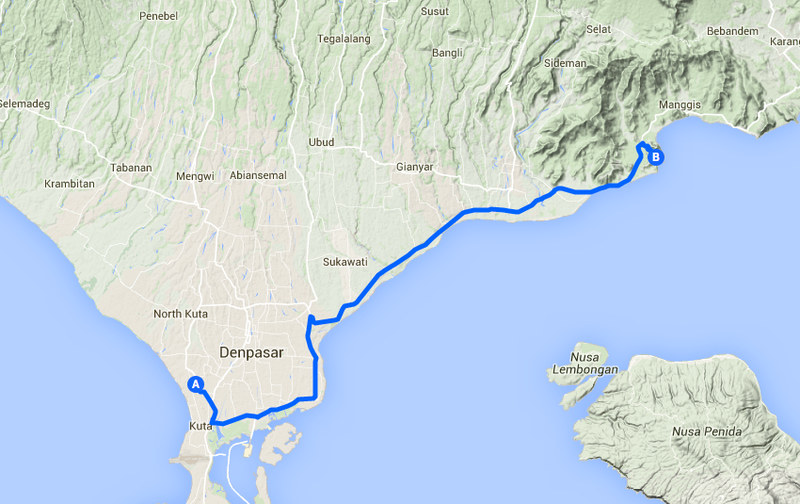 Or an alternative, longer and more adventurous route that would include an early morning two-hour bus ride from Denpasar to Padang Bai harbour (Bali), taking a slow ferry for 5 hours to Lembar (South Lombok), catching another bus for a couple of hours to Teluk Kode pier and finally taking a fifteen-minute speedboat ride from there to Gili Trawangan. As you may have guessed already, we took the slower option and I’ve to say I’m very glad we did! I have to admit though, that we first tried to organise accommodation for one more night in Bali to wait and see how the sea situation progressed. However, due to it being high season in Bali our villa was booked out and we guessed it would be hard to find another hotel so we finally decided on plan B. And so our odyssey began! The next day, at 6am a driver from the boat company came to pick us up. Of course, the wonderful hosts at Jineng Villas had already provided a homemade breakfast for us all as early as 5am! If you have ever sat in the front passenger seat of a car in south-east Asia, chances are you already know how chaotic traffic is over there. 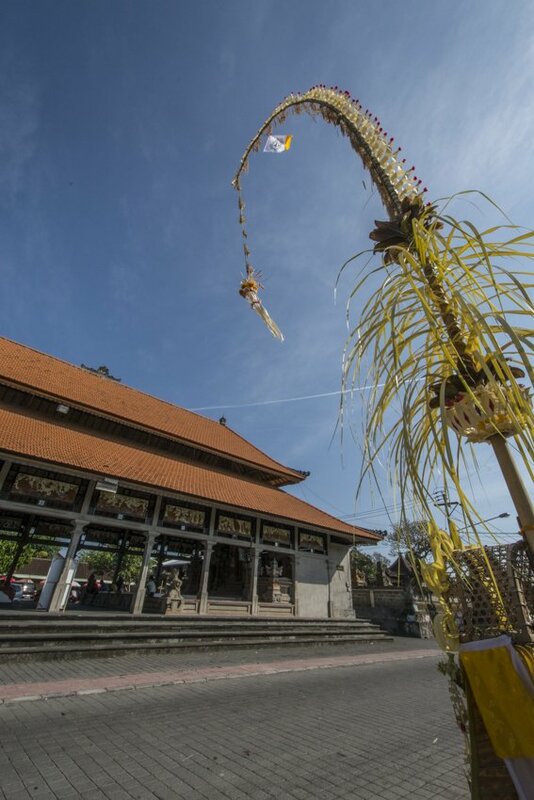 I tell you, Bali is not an exception and it took me a while to start enjoying the early bus ride after a few near misses with some motorbikes on the way. So far so good! In just over two hours we were already at the harbour in Padang Bay to catch one of those large ferry boats that ship cars and buses. Here our driver arranged passages for us and a bunch of other travellers in the same situation. We just had to drag our luggage upstairs to the passenger deck of the ferry and then we could relax for the whole five-hour sail. Since this ferry is the cheapest way to reach Lombok island and also because we were traveling during the last day of the Ramadan (a specially regarded day by the Muslim population of this island), the upper decks were already crowded by the time we went up and not many seats were available, most were already taken by the locals who were obviously in the know about what was available. Those unlucky enough not to find an actual seat were quickly settling down, laying on blankets and pillows on the floor or sitting with their backs against the wall, it was certainly not the first time they had been through the same routine. As with wherever you go you should make the most of the situation so we improvised by using our suitcases as seats for Michelle’s mum (who has a bad back) and dad for the five-hour journey. 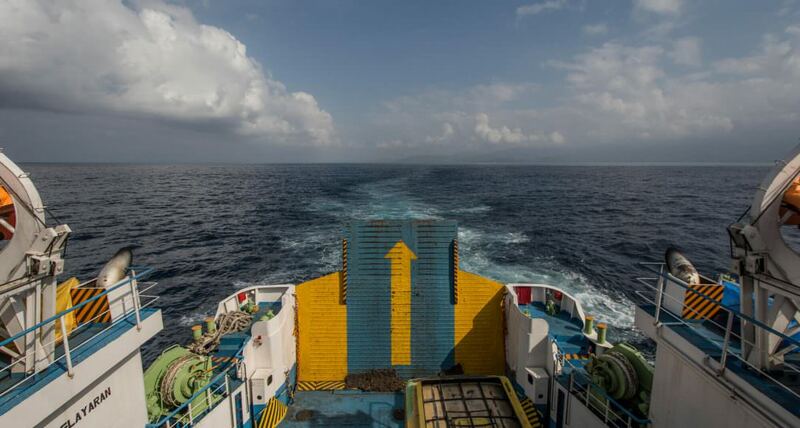 After all that hustle and bustle, the sail was pretty quiet except for some 10 minutes of rough seas midpoint between Bali and Lombok, with the big vessel tilting from one side to the other and upset stomachs all around. Definitely a smaller boat would not have been comfortable at all during these 10 minutes. Thanks Bali harbour master! Most of all, the highlight of the ferry ride was socializing with interesting people; there was the chatty girl going to visit her family in Lombok for the end of Ramadan with her husband and baby daughter or watching interesting scenes like that street vendor selling peanuts directly from the plant, still attached to the roots or more funny sights like the street musicians playing for some last-minute coins on the ferry before departure and having to jump over the deck fence straight into the water with guitar and all in the middle of claps and cheers from the crowd when the gates closed. 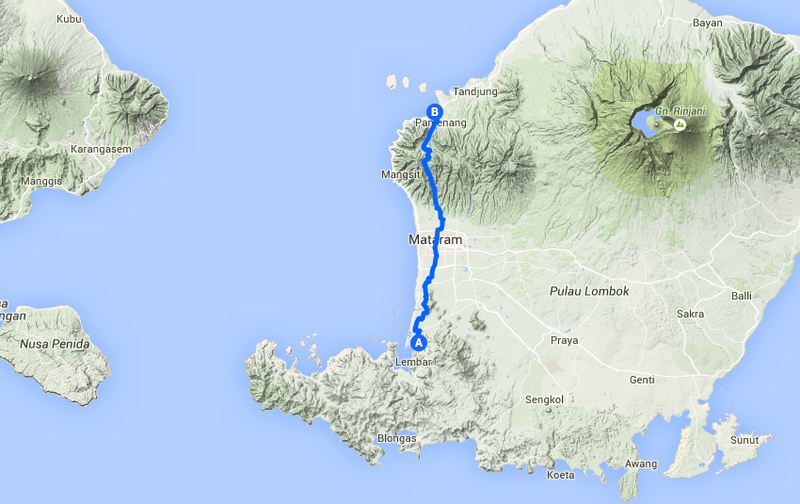 Once in the south harbour of Lombok another challenge began. How do you fit over thirty people with their luggage into three vans? The answer was clear to us after three representatives from Gili Getaway in Lembar accommodated all of us in their respective vans and set for Teluk Kode. The drive took us again two hours but this time we travelled through villages and rice fields with a multitude of mosque minarets on the horizon and the voice of muezzins in the ai calling for prayer. So much contrast in a single day! From the mostly Hindi Bali to the mainly Muslim Lombok. 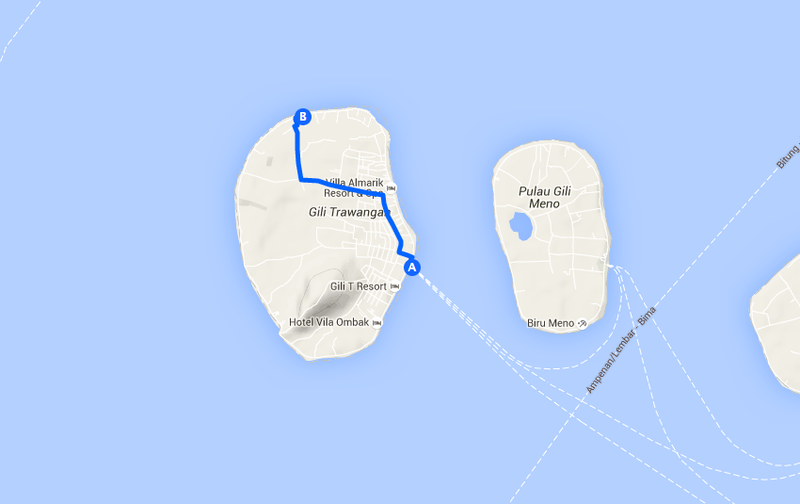 When at Teluk Kode pier, a bumpy 10-minute speed boat ride brought us all to Gili T.! Finally we made it! 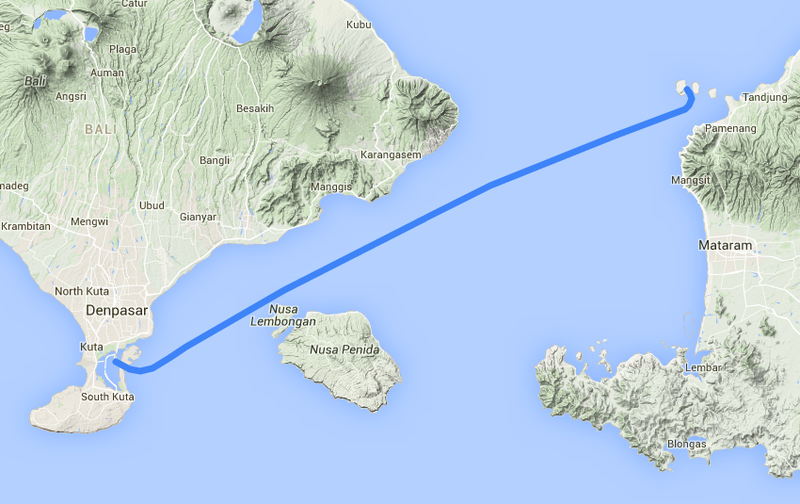 In just over 9 hours we made it to Gili Trawangan! 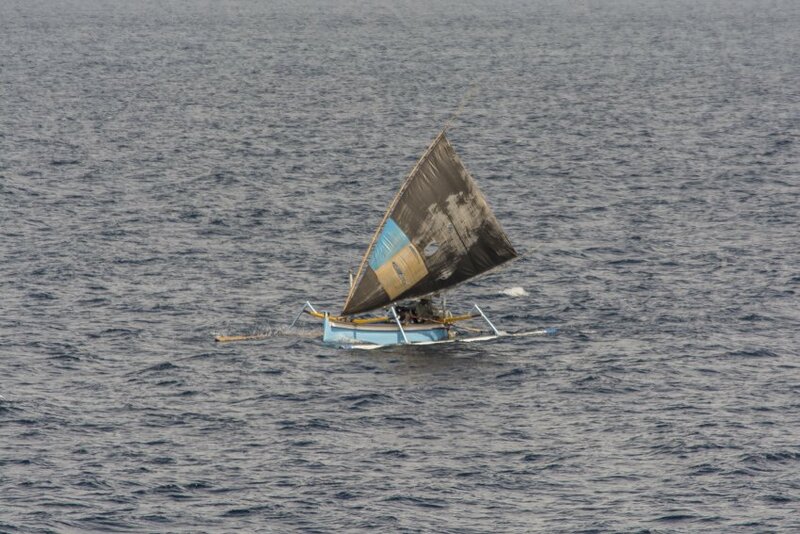 In a way it allowed us to experience the differences between two neighbouring islands. Thanks again Bali harbour master! Now the challenge was to get to our accommodation on the north of the island. Of course, after all the itinerary changes, the guys at our resort in the north of the island got confused and there was nobody to pick us up. 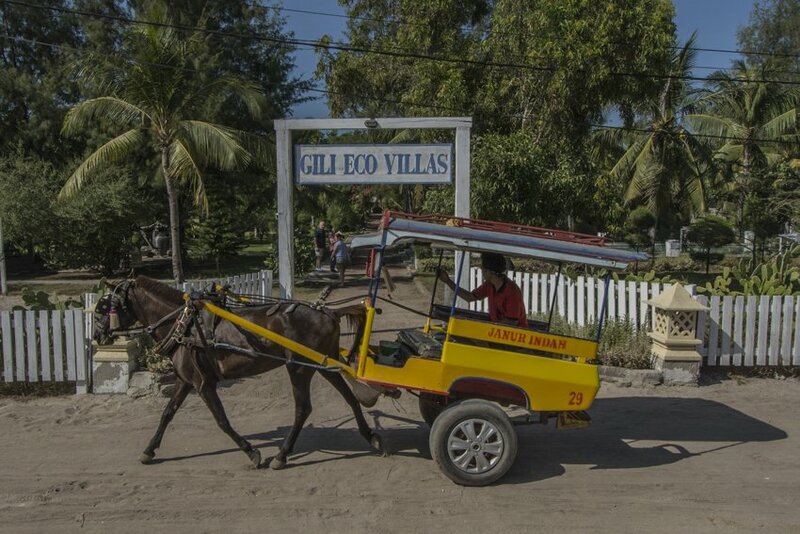 If you’re unfamiliar with Gili T., there is something you should know that gives a distinctive touch to this island: no combustion engines are allowed on this eco island. This leaves bicycles, electric scooters and horse carts as the only transport means available, besides the old and healthy “walk everywhere” thing. Horse cart it was! All of us jumped into a horse cart and in no time we were at our little piece of paradise ready to enjoy the many pleasures of the island but more on this in our next post. 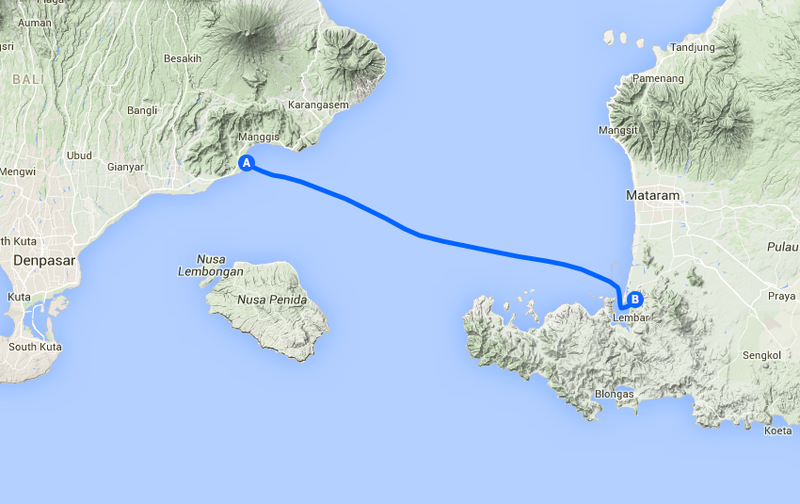 If you ever need to get to Gili islands from Bali, know that there is an alternative, longer option available other than the more expensive speed boat. You’ll not be disappointed if you ever decide to take it. Guaranteed! When travelling the unexpected can happen. Did you guys ever find yourself in a similar situation? We would love to know! Drop us a line in the comments section! 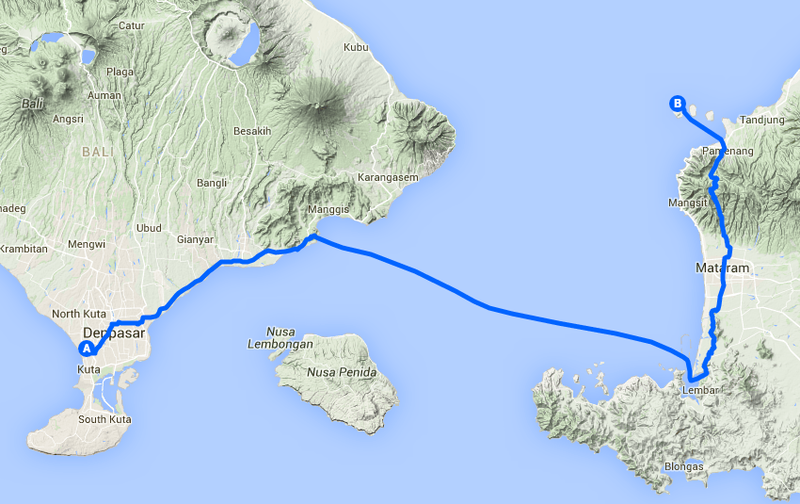 5 Comments on “How we went from Bali to Gili Trawangan, the harder and more adventurous way”. Join the Conversation Here! A very interesting read, as some of it I missed when I was actually experiencing it. I can now look back and say “what an adventure”. Also can’t recall you taking those fantastic photos. Also loved the maps, how do you do that????? (only 5 dollars per day!!) hotels. Islands is pretty small, I think it is plus cuz it makes my feel cosily. By the way, we was transfered on speed boats by easygili. com The price – 225k. Not so expensive anyway.